Having sensitive teeth can make eating and drinking more of a chore than something to enjoy, and unfortunately, millions of Americans suffer from pain caused by sensitive teeth. If you’re one of them, then it’s important to pay attention to what foods trigger the pain so that you can take care when consuming your favorite foods and drinks with them. 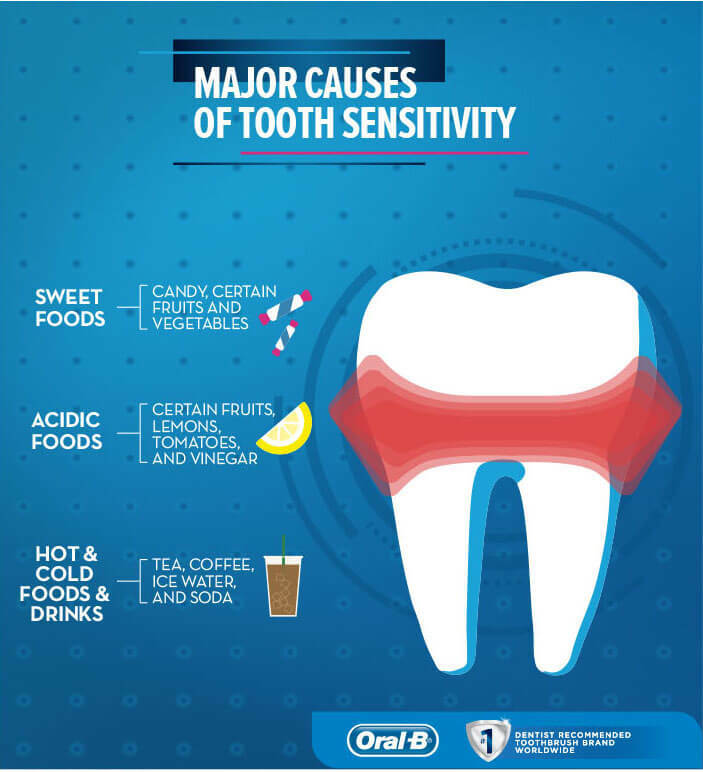 However, it’s even more important to understand why my teeth are sensitive so you can take steps to reduce it. The reason some people have tooth sensitivity is something called dentin, which is one of the primary substances that make up human teeth. In a healthy tooth, the nerves of the tooth are protected from things like hot, cold, and acid by dentin, which is in turn protected by enamel. But when the enamel wears away, it can expose the dentin below, leaving the nerves susceptible to temperature and other elements. When the nerves are exposed to these things, it triggers pain in your teeth and mouth. Many activities and substances can actually make tooth pain worse, including anything that will wear away the enamel on your teeth or expose the roots of your teeth. Great, My Teeth Are Sensitive. So What Can I Do About It? There’s good news for people who are suffering from sensitive teeth: there are treatments that can reduce the pain you experience when you eat and drink. You can mitigate the pain by brushing your teeth with a soft-bristled brush, using desensitizing toothpaste, rinsing your mouth daily with an alcohol-free fluoridated mouthwash, avoiding acidic foods and beverages, and using a straw to consume cold or acidic substances. Finally, it’s also a great idea to schedule an appointment with Dr. Gary Skrobanek at GPS Dental in San Antonio because he may be able to suggest dental procedures or solutions that may further reduce pain, including crowns, bonding, root canals, fixing cracks, or even a custom mouthguard to protect your teeth and enamel from nighttime grinding. Sensitive teeth can make life a pain and turn every meal into a minefield of figuring out where to chew comfortably; you might even be avoiding certain foods and doing what you can to prevent pain. Fortunately, there are things you can do to reduce pain caused by tooth sensitivity. Along with proper oral hygiene habits and avoiding certain substances, you can also talk to Dr. Skrobanek about what procedures might help make your teeth less sensitive. Dr. Gary P. Skrobanek’s experienced and friendly team at GPS Dental offers family dentistry for all ages in San Antonio, TX area. Our Brooks City Base dentist office is conveniently located and offers early morning appointment times Monday through Friday to meet your needs. At GPS Dental, we promote dental health awareness to our patients and provide most dental services, from family and general dentistry to dental implants, sleep apnea, TMJ / TMD Treatment, cosmetic dentistry and much more. We accept most dental insurance plans and offer affordable financial solutions for any budget. Call us at (210) 633-3477 to make an appointment.